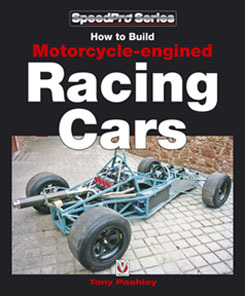 How to Build Motorcycle-engined Racing Cars, by Tony Pashley. ISBN: 978-1-845841-23-1, £24.99 (+ P&P). Click here to order or see a sample When this book landed on my doormat I opened it with much interest, as it isn’t something I would normally read about. If I show the book to my wife I know that there will be a polite look of interest followed by a snort of derision at the idea of me building a car. I might have the spanner set, but they are still largely unscratched and unused in their original carry case, unsullied by grease and oil. But how hard can it be anyway – I was exceedingly handy with a technical Lego set as a child! Reading the introduction entitled “Health Warning” didn’t seem to me to be any different to my usual experiences. Mr Pashley says “You’ll also have suffered the ridicule and contempt of family and acquaintances as you neglect all of the duties and pastimes of the ‘real world’, and maybe, just maybe, excite a few feelings of respect and even envy in the folk whose views you care about”. It sounds as though building a motorcycle-engined race car is just like maintaining my website! The book has certainly achieved one of its aims – it has convinced me that I would be unable to do it. It takes you step by step through the entire construction process, highlighting all of the bits and pieces that you need to consider. However, to read the book it helps if you have some familiarity with metal working terminology – especially as you will be expected to construct your own chassis, either from metal tubing on aluminium honeycomb. If you don’t know how to weld you ought to buy a companion volume and practice first, and if using glues, you will need something stronger than prit-stick. The book is about proper engineering…..
Reading the book is like talking to a knowledgeable mate down the pub, helping you to avoid the pitfalls and giving you the benefit of the authors experience. What is also great are the diagrams in the book, helping to simplify what can be complex topics such as suspension. But the book is not the be all and end all on the subject, and it doesn’t pretend to be. What it is is a good all round basic introduction to the subject and the issues involved, with pointers to where the budding builder can find out more information as and where needed. If you are thinking of perhaps building your own car, then buy and read this book before you start, and if you are still enthusiastic at the end of it, read the other books referenced. At the very least you will make a better informed decision, but as to whether it was the right one only time (and perhaps track results) will tell. 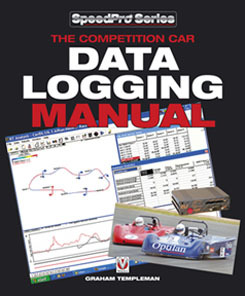 The Competition Car Data Logging Manual, by Graham Templeman. ISBN: 978-1-84584-162-1, £19.99 (+ P&P). The book is clearly written and easy to understand, but then I am familiar with terms such as Controller Area Network (CAN) busses and ECU's through my work, so I can't assume that the novice reader will find to quite so clear, although I don't see why not. I would also recommend the book to anyone who is starting to learn about data analysis in any field, not just data logging from competition cars. The book quite clearly deals with issues such as sampling frequencies and the effect on data, as well as data averaging and measurement ranges. I've met all such problems in the lab before, and it would have been useful to have read this book then. It also tells you a lot about what to look for in your resulting traces, and how to try and understand dynamic issues from what you see. Armed with this book, you could make a good start on understanding them. However, it does sometimes use acronyms without defining what they are, e.g. on pg 78, limited slip diff becomes lsd without warning, and should really be capitalised, as with the use of CAN earlier in the book. Without defining what the acronym is you could read something completely different for those three letters..... Also, there are very occasional layout issues, with small amounts of text placed between diagrams, so that you can lose the reading flow when going from page to page. But these things are minor. I found the pointers to car behaviour from the traces and hints given to setup to be illuminating and potentially very useful to the driver wishing to learn the art of driving faster. If nothing else, it gives you a very different insight into F1 testing and what the drivers do in their briefings with their engineers, and for that it is well worth reading.